The two cars recovered from Foss Lake in western Oklahoma. Bodies were found inside both. The discoveries may help solve the mysteries of what happened to people who went missing decades ago. "At first," adds the Daily News, "officers weren't aware of the remains" inside. 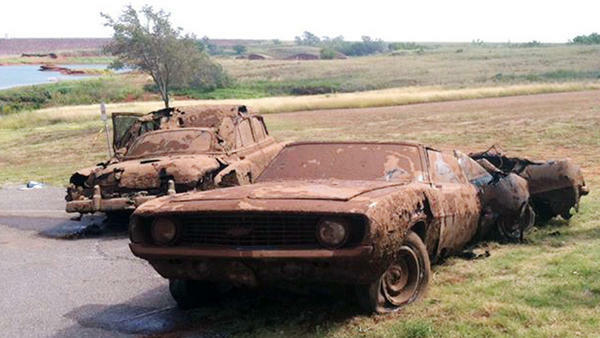 But when the vehicles were pulled from the lake Tuesday, three bodies were found inside a car matching the description of a 1969 Chevrolet Camaro last seen in 1970 with three local teenagers inside. The other car, with two or possibly three sets of remains in it, appears to be a 1950s Chevy similar to one last seen being driven by a local couple in the early 1960s. Authorities are working on identifying the remains. How the cars and the people inside ended up in the lake, particularly "side by side," as the Daily News put it, remains a mystery. Some family members of the long-missing persons tell Oklahoma Cilty's KFOR-TV that at the very least, they may now have some clues about what happened to their loved ones.